Whether it’s blueberry stripes on red, white, and blue Fourth of July cakes or blueberry mojitos, the sweet berry signals the height of summer. “My family and I eat blueberries out of hand—a pint may make it half a day,” says Debby Maugans, author of Small-Batch Baking and the newly released Small-Batch Baking for Chocolate Lovers. Maugans throws berries into oatmeal with toasted almonds, lemon sorbet, peanut butter sandwiches, or a savory pulled chicken and spring onion salad dressed with mustard vinaigrette. She also likes to incorporate them into desserts and garnishes. This petite trifle is one of her favorite recipes. “The cake is delicious warm,” says Maugans. 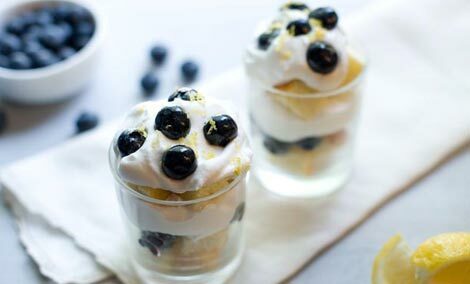 “If you layer the ingredients while it’s still cooling, the lemon cream just melts into the cake and the blueberries’ taste and texture really stand out.” She recommends punching up the sweetness of the berries with a squeeze of lemon.